Are fall leaves good for the garden? Is it okay to use leaves as mulch? Find out the natural benefits of leaves and how to make the most of them in your growing space. This is part of a series on helpful tips for enriching your garden with compost and mulch and other organic matter. Are Fallen Leaves Good for the Garden? Is it okay to use leaves as mulch? And the answers are a resounding yes and yes, leaves are excellent for the garden and make great mulch. Don’t Bag It programs like this one in Texas are popping up in communities as more people realize that fall leaves are extraordinarily good for the garden. In addition to all the natural, free benefits they provide—more on these below—the time and effort to send them away are costly, inefficient, and not so eco-friendly. The same way fallen leaves work in natural settings, they also help our gardens. On the ground, they protect the soil and insulate plant roots. As they decompose, they contribute to soil structure, help retain moisture and prevent erosion, and—this is where the magic happens—microbes, fungi, and other amazing bacteria convert leaves to essential plant nutrients. The benefits are so good, it’s kind of crazy that we ever thought it was good to send them away! 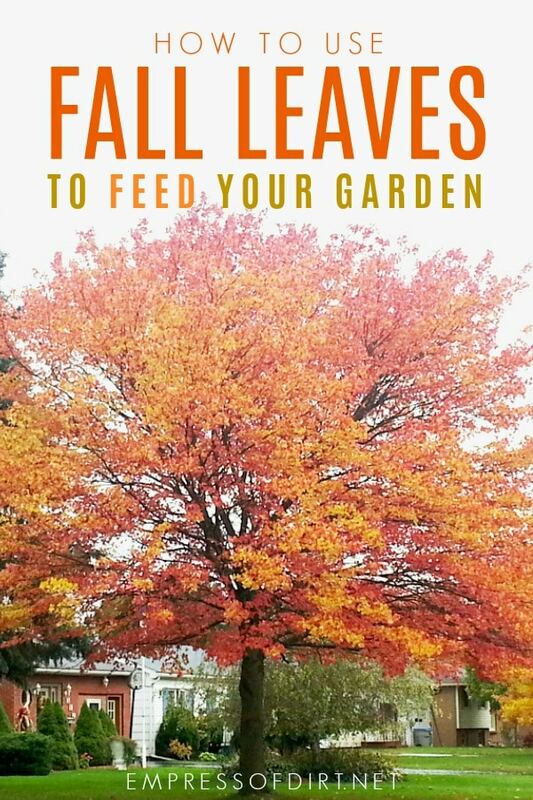 Plus, it’s much less time and work to keep leaves right where we need them, providing perfect soil food. I have mulching lawnmower like this one that grinds stuff up as it cuts. I suspect other lawnmowers can do it as well. It’s amazing how this process reduces what would have been a big pile of a leaves into an armful at most. 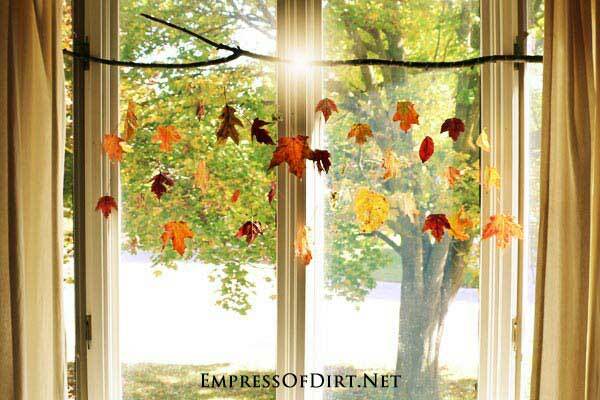 With the leaves reduced to little bits, there’s nothing else to be done. If the end results are less than a half inch deep on your lawn, your work is done. If they’re deeper than that, rake the surplus into your garden beds. My neighbour and I each get the same amount of leaves in our yards (a lot of them). He likes to rake and remove every leaf. I prefer to keep mine, so I thought it would be interesting to compare our work loads and end results. During the weeks of leaf drop, I saw him out there for a total of approximately 21 hours of raking and bagging. He probably filled about 30 large yard waste bags. I can see how much he’s out there because my office window faces our yards. I’m really not stalking him! Now, granted, he likes to do a lot of yard work, so his time was very likely longer than someone who just wanted to get the job done. But, even with that in mind, it’s probably 15 hours of raking, lifting, bagging, and transporting. In contrast, I waited until 90% of the leaves had dropped, and then ran my mulching lawnmower over them. This simply grinds the leaves up into smaller bits on the lawn. There were enough leaves that I had to go over them twice, equivalent to mowing our lawn two times. My total time spent was about 2.5 hours. The neighbour’s leaves were hauled to a local yard waste collection site. My mulched leaves stayed right on the lawn and any extra were placed on garden beds. As mentioned, once you run the mulching lawnmower over them, they are reduced to a fraction of their original size. Sometimes the volume is so small after shredding that I wish I had more leaves. In fact, this may be the year that I ask my neighbours if I can have their bagged leaves. But even if it wasn’t more time efficient, I’d still do it. By ‘mulch’ we mean a natural material used to protect garden beds. This could be whole or shredded leaves. I like to use shredded leaves simply because they break down faster and there’s less risk of them forming a water-tight barrier over the soil. Fall leaves can be used to insulate flower and veggie beds in the winter. Before decomposition, they will help keep moisture in, insulate plant roots, prevent soil erosion, and suppress weeds. As they gradually break down, they provide nutritional, soil-enriching goodness. A depth of 2-3 inches is commonly recommended for whole leaves. If leaves are shredded, you can go deeper because rain can still get through as needed. You can also use clumps of leaves to cover and insulate hardy but vulnerable perennials and winter veggies. 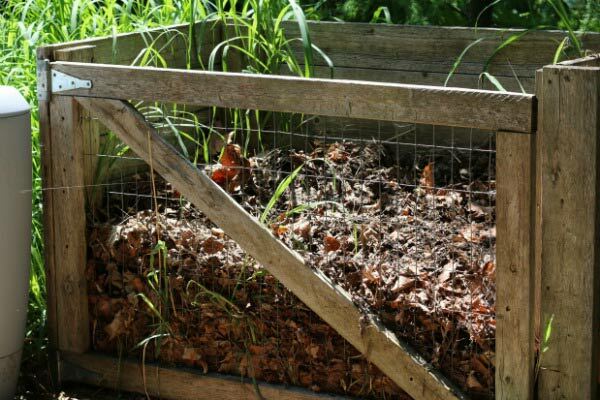 This article has all the basics for getting started with compost. Greens are the fruit and veggie scraps. Browns are carbon-rich materials including fallen leaves. 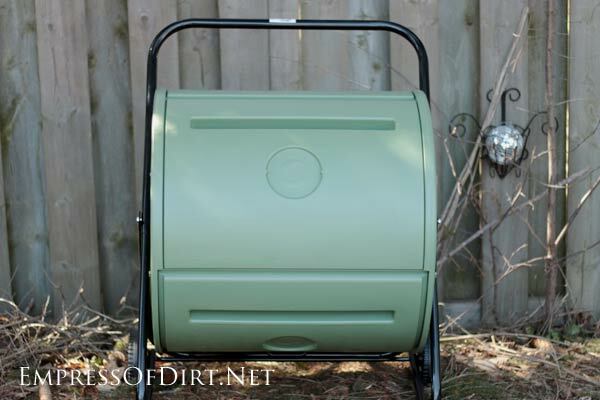 To avoid running short of browns, I like to keep a big container of shredded leaves by my composter so I can add them as needed throughout the year. 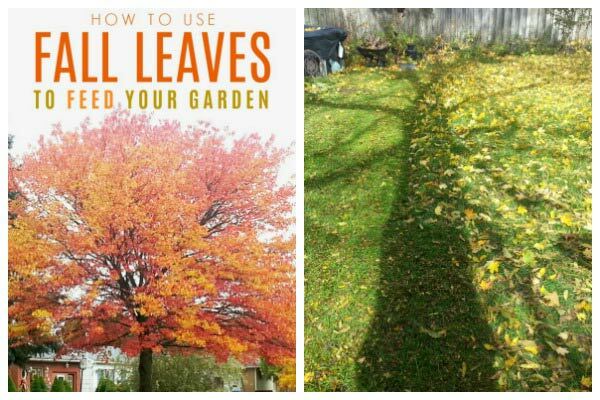 I have no idea why it has this name because it does not sound very appealing, but leaf mold is the simplest thing to make and does great things for your garden. 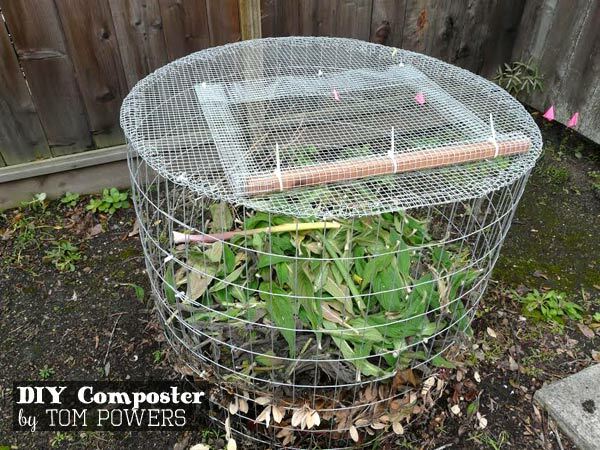 Take a pile of leaves-either shredded or not—but shredded will decompose faster–and, place them in something like this DIY hardware cloth yard waste bin so rain can reach them. Depending on the type and size of leaves, in months or a year, the leaves will decompose, leaving you with earthy, soil-like goodness for the garden. Seriously, the first time you do this, take a before photo. The first time I made leaf mold, I piled them up in fall and found this beautiful pile of compost awaiting me in spring. It was garden magic. And couldn’t be easier. Once decomposed, leaf mold can be added to your garden beds as mulch to protect and gradually feed the soil. Keeping leaves saves times, work, and money. Plus, leaves are important organic matter that supports everything that lives in our gardens. 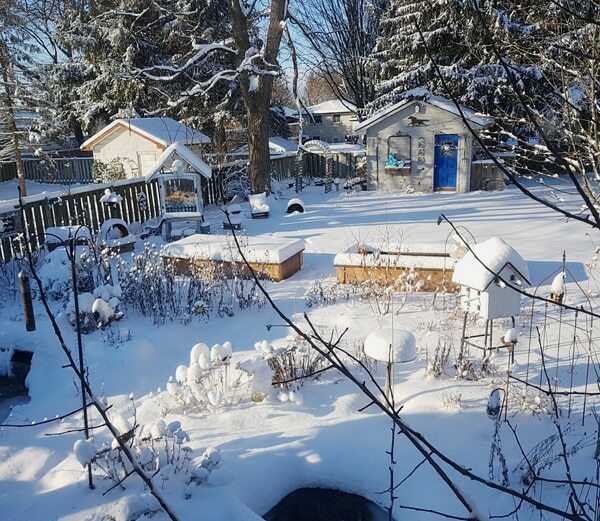 To us it might look like a pile of leaves and may be covered in snow: for the animals, insects, microbes, and more, it’s food and habitat to sustain them during the long winter months.